You’ve probably heard about reverse flow smokers recently and started trying to figure out what the differences might be that explains the hype. Especially since they are often referred to as the superior alternative to a traditional offset smoker which can end up burning your food if you’re not savvy or careful. Well, since they feature a thorough smoke flow and a much evener temperature distribution, they work great in creating perfectly smoked meat every time. We’ll share our favorite one with you, but in the end, you can decide what’s best for you after we explain everything in detail. I kept running into issues with hot spots while barbecuing, and you might relate if you’re having the same issue. Mastering the art of different temperatures across your grill isn’t for everyone, and it might cost you a lot of burnt meat. So I did my research and decided to give reverse flow BBQ smokers a try since I read they are able to distribute the temperature evenly. After some product research, I ended up buying the Oklahoma Joe’s Longhorn Reverse Flow Smoker available on Amazon and I haven’t looked back ever since. I needed a barbecue made with high-quality steel in order to retain the heat better. I also needed a large grilling area since I like to entertain all my family and friends when they come over, and they all have their own preferred meats, which meant I needed plenty of space as this grill provides. Now, if you’re not prepared to spend so much into a reverse flow BBQ smoker or are more of a casual barbecuer and don’t need as much grilling space, Oklahoma Joe’s also features a smaller (but equally professional) reverse flow BBQ smoker. So if you’re looking for the same level of quality, but at a lower price, look no further than Oklahoma Joe’s Highland Reverse Flow Smoker. Whatever your situation is, look no further than Oklahoma Joe’s quality products. However, in order to better help you choose which one would work best for you, I’ll share their common specifications and grill dimensions so you can decide if you have the need for one or the other. Oklahoma Joe’s Highland Reverse Flow Smoker 900 square inch cooking surface, perfect for casual cookouts in your backyard. 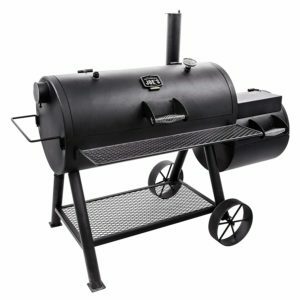 Oklahoma Joe’s Longhorn Reverse Flow Smoker 1060 square inch cooking surface, which makes it perfect for entertaining large groups of people. Now you might be interested in acquiring either of these reverse flow smokers and start showing off your skills. 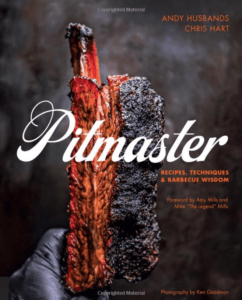 However, it’s also important to understand how these BBQ smokers work and how you can get the best out of them to make sure you don’t run into the same old issues with some of the other bbq smoker brands. In this article, I’ll explain the science behind reverse flow BBQ smokers and how that makes them different from standard offset smokers. This will also help you decide which of the above better suits your needs and will help you embark on the road to reverse flow barbecuing. First of all, what makes a reverse flow smoker different than a standard offset smoker? Heat in offset smokers may vary across different spots on the grill which create “hot spots” inside the chamber. This can be a big problem, especially if you’re not experienced, like me. This is the biggest reason why I stayed away from them. However, some people prefer this since it gives them a chance to smoke some meats faster or slower depending on where they place them within the chamber. On the other hand, reverse flow smokers have a steel plate inside the cooking chamber which lets heat pass underneath the grill at its highest temperature and then over it at a slightly lower temperature. Reverse flow smokers allow heat to be evenly distributed across the cooking chamber of your BBQ smoker. This protects the meat from intense heat while also directing it under and then back over the meat before exiting through the chimney. This extra plate and the location of the chimney on these smokers mean that smoke remains inside the pit for a longer period of time. This feature makes it perfect for slowly smoking large meats. And yes, grilling using a reverse flow smoker usually takes longer since you don’t have those “hot spots” that speed up the cooking but your meats will be smoked more evenly, producing better results. Now in order to better understand what makes reverse flow smokers better, in my opinion, it’s useful to know what the design does or “how it works”. How do reverse flow BBQ smokers work? Like I mentioned above, these smokers have an extra plate underneath the cooking surface. Heat drafts from the firebox and into the cooking chamber then draw down under a baffled-flue to the end. At that point, the flow reverses (which gave it its nickname) and then drafts back over the top of the heated baffle-flue. The heated baffle or flue is designed as a water and grease tight griddle or pan. The cooking racks are then positioned on top of the of that griddle. Remember that heat is used twice and this sears the fat on the welded griddle. And what do you get with this? Meat that is moist, tender and full of flavor, without all the extra fat. Apart from guiding the direction in which the smoke flows, the steel plate also helps by blocking the direct, harsh heat from overcooking the meat that is in close proximity to the firebox. It also creates a more even cooking temperature since it acts as a heat sink and like we said earlier, it doubles as a grease and/or watertight pan. But don’t just take my word for it, check out what other reviewers are saying. Some have even shared pictures of their deliciously smoked meats on this barbecue, so you can get a general idea. What are the benefits or pros of a reverse flow smoker? Even heat distribution across the chamber which reduces the need to turn the meat while cooking. This heat distribution makes it less prone to temperature spikes after adding more fuel to the fire, which leads to “hot spots”. More even smoke distribution, which thoroughly infuses your meat with a smoky flavor and taste. Since fat renders out of the meat, sears on the griddle pan and filters through the cooking chamber, you will experience improved moisture and flavor. No need to have an additional water and grease tray, since it’s already incorporated. The most important benefit is that it makes smoking your meat even easier. So if you want to save yourself from the hassle, or want to share your passion with others and show them your skills, it will also be easier for them to achieve delicious results. This means you’ll be surrounded by deliciously-smoked meat much more often. 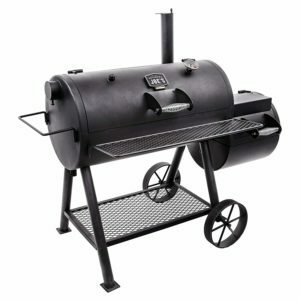 So what makes the Oklahoma Joe’s Reverse Flow Smokers the best for me (and for you)? Char-broil Oklahoma Joe’s have always been recognized for their high quality and value. The same remains true for their reverse flow BBQ smokers line. They have two of the leading reverse flow smokers in the market, the Highland Reverse and the Longhorn Reverse, mentioned at the beginning of this article. Both smokers have proven to be a solid, long-lasting investment that is bound to make your barbecuing experience easier and better. 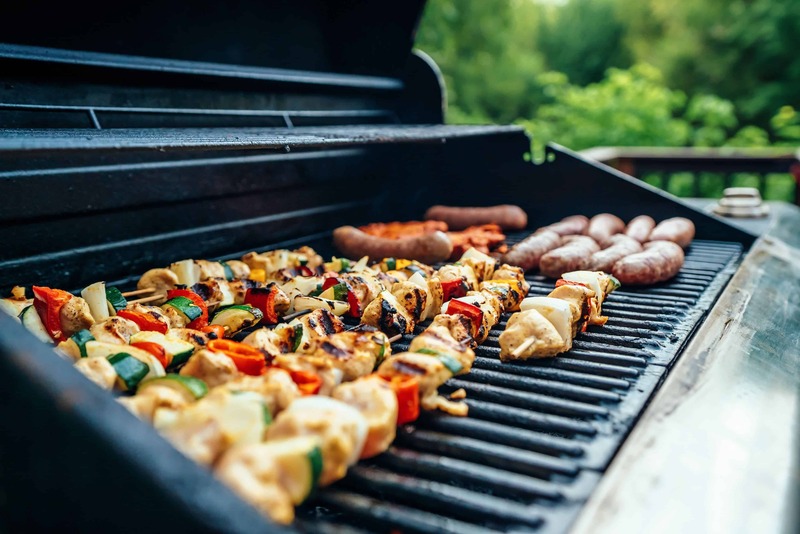 Both smokers also give you full and accurate control over your barbecue’s temperature, thanks to the multiple dampers and the professional-grade thermometer included with your smoker. And since they are also made of heavy-duty, 2.5mm thick painted steel which allows them to retain heat, their build creates the perfect environment for reverse flow cooking. Many reviewers have even decided to make some modifications themselves which take your smoker to the next level, such as adding 2 more thermometers, using different sealants and adjusting the position of pieces when putting the smoker together. Several have mentioned that this ability to easily upgrade your smoker to your personal preferences is what makes it the best option in the market. I, personally, decided to implement one additional thermometer just to make sure I have everything under control and can easily adjust the fire for the best grilling results. On top of this, they both feature a large and easy to clean firebox, two storage shelves and a heavy-duty cart with wheels strong enough to move this barbecue as far as you want it to. It also has a 2-year warranty, and we’re pretty sure it will last through the years. I still haven’t had a single issue with mine. To wrap things up, reverse flow smokers are the perfect solution for every struggling BBQ aficionado. Stop fighting your BBQ and let it work with you, instead. And Oklahoma Joe’s line of reverse flow smokers is the best to help you achieve this cooperation. If you’re convinced and are ready to get your own, you can check the latest price on Amazon. Or check out our guide to the best smoker accessories you can buy to start grilling.